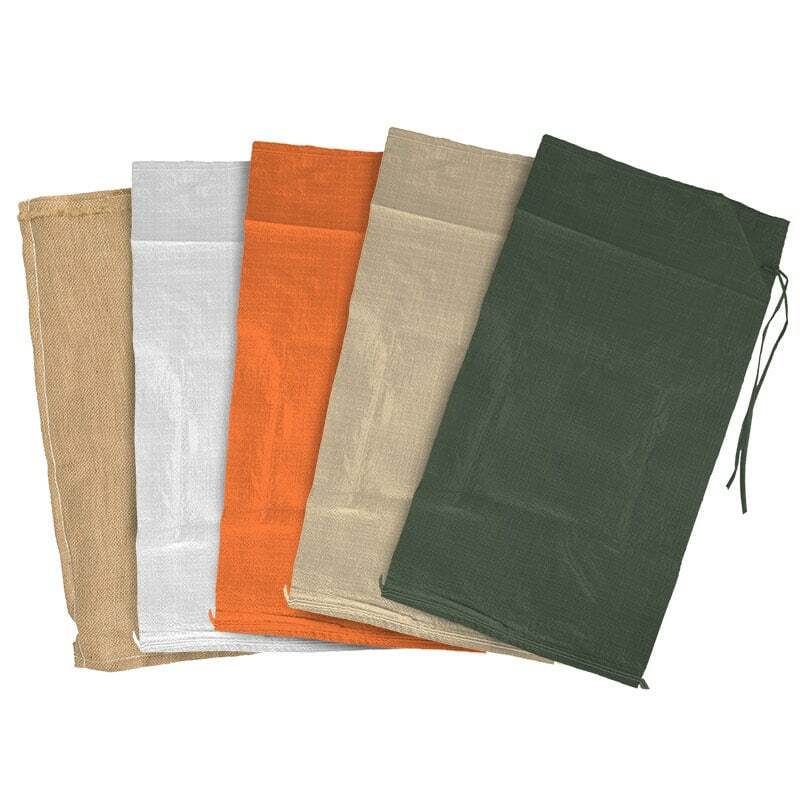 A sand bag is a bag or sack made of burlap, polypropylene or other materials, that is filled with sand or soil and used for such purposes as flood control, military fortification and other applications. Sandbags may be used during emergencies when rivers threaten to overflow their banks, or when a levee or dike is damaged. They may also be used in non-emergency situations (or after an emergency) as a foundation for new levees or other water-control structures. After usage, dry sandbags can be stored for future use. Wet bags may need to be disposed of as they may be contaminated by chemicals and other matter. In general, sandags are inexpensive as well as compact and lightweight when empty for easy storage and transportation. Filling the bag and transporting them once they are filled can be labor intensive. Check the UV rating on the sandbag material to help prevent degradation from the sun and other elements once the sandbags are on-site. The most common size for sandbags is 14 by 26 inches (36 by 66 cm). Other sizes are 15 X 31 inch and 17 X 32 inch. These dimensions, and the weight of sand a bag this size can hold, allow for the construction of an interlocking wall like brickwork. Individual filled bags are not too heavy to lift and move into place when properly filled. Sandbags have traditionally been filled manually using shovels. Since the 1990s, machine filling has become more common, allowing the work to be done more quickly and efficiently. Burlap was the most widely used material until users discovered that polypropylene plastic does not decompose as easily. When covered from UV exposure, polypropylene sandbags last almost indefinitely with a minimum of care. They are not biodegradable and will need to be disposed of properly if not situated for permanent use. This bag resists all kinds of severe weather but will eventually rot of not covered or protected from the elements. Empty bags can be stockpiled for emergency use and will not deteriorate for several years if properly stored. They are environmentally friendly and handle heavy flows of water and filtrates particle sizes as small coarse to medium silt (.05 to .02 mm in size). Heavy 8.9 oz natural burlap.